The Pepper Visual Skills for Reading Test (VSRT)™ provides the low vision therapist with an accurate and reliable estimate of a reader’s ability in the visual components of the reading process. The instrument can also indicate areas of potential problems that may be addressed in an instruction program. The Pepper VSRT™ has been developed to assess the reading performance of adult readers who were reading efficiently before the onset of macular disease that creates central scotomas which inhibit efficient reading. In this third edition of the Pepper Visual Skills for Reading Test™ , the font and sizing have changed slightly. The original Pepper Test™ was developed using print technology that is no longer available, and the original printing plates were inadvertently destroyed. Further, the original Pepper Test™ cards were printed and published prior to the concept of "critical print size" for reading, and the advent of acuity and reading charts with logarithmic size progression of symbols for more accurate testing. The authors and publisher have created a new set of print cards that are as close to the original Pepper Test as can be managed using computer-generated fonts and chart sizes that correspond to logarithmic steps in visual acuity charts. This third edition of the Pepper Test™ is an updated but faithful rendition of the original. In addition, we have responded to requests from the field to print the test cards on a more durable material, and we have double-sided the cards to make the test easier to use and more light-weight for peripatetic professionals. Watson, GR, Schuchard, RA, De l’Aune, WR, Wyse, E. “Effects of Preferred Retinal Locus Placement on Text Navigation and Development of an Advantageous Trained Retinal Locus” Journal of Rehabilitation Research and Development Vol 43 (6) 2006. Watson, GR, Ramsey, V, De l’Aune, WR, Elk, A. “Ergonomic Enhancement for Older Readers with Low Vision” Journal of Visual Impairment and Blindness Vol 98 (4) 2004. Lott LA, Schneck ME, Haegerström-Portnoy G, Brabyn JA, Gildengorin GL, West CG "Reading performance in older adults with good acuity".Optom Vis Sci. 2001 May;78(5):316-24. Watson, GR, Baldasare, J, Whittaker, SG, The Validity and Clinical Uses of the Pepper Visual Skills for Reading Test, Journal of Visual Impairment and Blindness, March, l990. Baldasare, J; Watson, GR, The Development and Evaluation of a Reading Test for Low Vision Individuals with Macular Loss, Journal of Visual Impairment and Blindness, June 1986. Question: I am an occupational therapist at a traumatic brain injury facility. I have been looking at the Pepper VSRT because of its claim to assess word recognition, saccade control, and return-sweep eye movement control. I would really like to talk to someone about if this test has been used with the TBI population or if it truly is just for the mac degen population. However, since reading speed is a functional area that can be improved in our population, I keep coming back to the Pepper VSRT in my own research. We of course are willing to formally study this test with our population. Please let me know your thoughts. Thank you. To my knowledge there have been no studies with people with brain injuries measuring aspects of reading using the VSRT. Personally I have found the test extremely useful for detecting reading deficits and strengths in people with brain damage from stroke or other injuries. However, I do not focus on reading speed as an outcome. Rather, I look at reading comprehension. 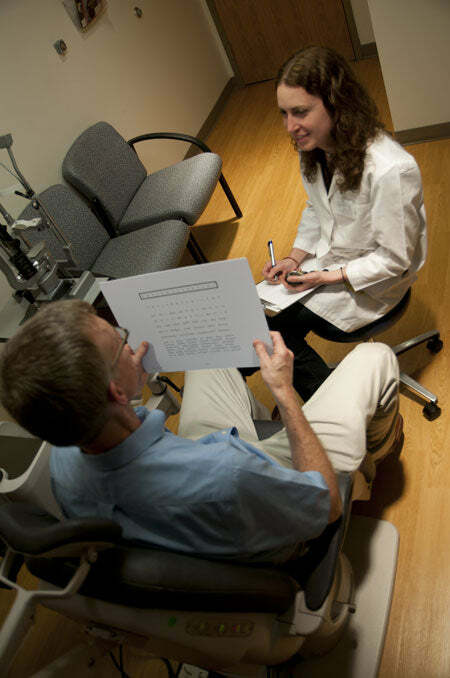 The Morgan Low Vision Reading Comprehension Assessment is a great tool to use in combination with the VSRT. QUESTION: I am an occupational therapist. We are using the Pepper VSRT in conjunction with a driving simulator as an additional testing variable to provide doctors with objective data on patients' visual skills so that they can make decisions related to driving based on objective testing scores. After reading the manual, I cannot find any normative data for what is within normal limits, what is impaired, what is significantly impaired, etc. After doing some research, it is difficult to find normative data in general for oral reading skills. It is crucial for us to relate our scores to normative data in our final report. It is not our intent for this test alone does not decide whether someone continues to drive; it is just an additional variable to provide doctors, who have the final say. For example, we have a patient who was 100% accurate during the reading, but he took 2 minutes to complete the 90 words. Can you walk me through how we would score this? This is our thought: total number correct: 90, 100% correct. total test time: 2 minutes 15 seconds = 2.25 minutes. corrected reading rate= 90/2.25, which is 40 WPM. Is this correct that the patients reads at a level of 40 WPM? Please provide us with some data on scores that are both within and below normal limits. Thank you! I don’t think the Pepper Test is the best measure for objective visual skills data related to driving. The visual skills used in driving would be quite different from those used in reading – and the eye movements would take place over a much larger field of view. Reading requires fixations, saccades and return sweep eye movements from a normal reader. Readers with low vision who do not have central visual field loss may use these same eye movements. Those with macular loss also make fixations with their PRL, but instead of saccades may make a kind of optokinetic nystagus-like movement (e.g., similar to reading the signs on a train as it passes). Because the reading text may only be 8 or so inches across, these eye movements are made in a small area, about 25 or so degrees in the central visual field. Driving requires fixation, saccades and pursuits over the full range of visual field, including wide head movements. The driver is required to use peripheral vision as the “where” in locating a target of interest (say, a child chasing a ball into the street from the side) and then quickly make a fixation to the target to identify the “what”. The Pepper Test cannot measure these types of eye movements that are critical to driving. You might consider using Useful Field of View (UFOV) as a better measure. After reading the manual, I cannot find any normative data for what is within normal limits, what is impaired, what is significantly impaired, etc. There is no normative data for readers with macular loss (the population for whom this test was developed). Reading rate among readers with macular loss is dependent on a variety of factors, one of which is scotoma size (see http://www.ncbi.nlm.nih.gov/pubmed/8430009). Developing normative information for reading rate among these readers would require very large scale studies that stratified for the variables that affect reading rate. After doing some research, it is difficult to find normative data in general for oral reading skills. It is crucial for us to relate our scores to normative data in our final report. It is not our intent for this test alone does not decide whether someone continues to drive; it is just an additional variable to provide doctors, who have the final say. For normative reading (silent vs. oral) data among those who are normally sighted see the publications of Ronald Carver. Well, there are 110 items on the test – are you saying your subject missed 20 items? I don’t know how to answer this, as there are 110 items on the test, so if your subject read only 90 items, s/he did not get 100% correct. Please note that this reading rate with the Pepper Test is slower than the way a person normally reads for two reasons. First it is an oral rate (slower than silent rate) and the text is unrelated letters and words (people read faster when the text is meaningful, as the ability to anticipate meaning leads to faster recognition). Is this correct that the patients reads at a level of 40 WPM? Please provide us with some data on scores that are both within and below normal limits. The Pepper VSRT is designed to assess the impact of a central scotoma on text navigation. For that purpose, it uses unrelated letters and words, so that the test taker cannot guess what comes next. Text navigation is only one component of the overall task of reading, and the Pepper VSRT was designed to measure this construct only. Additionally, because the test taker is required to give oral responses as opposed to silent reading, it is slower than silent reading. To the best of my knowledge, the correlation between the Pepper VSRT and silent reading has not been established. There is research about the relationship between oral and silent reading (see for example http://www.ncbi.nlm.nih.gov/pmc/articles/PMC3104321/). However, keep in mind that reading fluency (speed and accuracy) is largely dependent upon reading comprehension. A better measure of reading comprehension in clients with visual impairments might be the Morgan Low Vision Reading Comprehension Assessment. I would very much hesitate to assume that this person "reads" at 40 words per minute. Indeed the results of the Pepper VSRT demonstrate a reading rate of 40 wpm, but it is within the context of the test, which is oral, and is more similar to a word list, rather than a passage. Again, it does not take into consideration reading comprehension which ultimately relates to the test-taker's ability to use, act on, and apply to daily life the information that was read. With regards to driving, keep in mind that the Pepper VSRT requires the user to foveate and make saccades only within the central 15-20' of the visual field. Drivers are required to alternate between central and peripheral locations in a rapid manner. In summary, the Pepper VSRT is not designed to measure any constructs related to driving and there are no known correlations between text navigation with a central scotoma and those constructs.